Next to these labels are also red Arabic numerals that are combined with the design of the black dial. Indication of hours, minutes and seconds by the central arrow, hour and minute of which are covered with white luminescent substance. Interesting design direction a second time zone: it skeletonirovana and has a red tip, which looks very nice with red Arabic numerals. 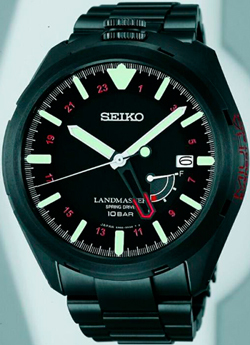 In “4:00” is a power reserve indicator, while the label “3:00” – large aperture date. Sapphire crystal protects the dial with anti-reflective coating. The crown is placed at the label of “12 hours”. New Prospex Landmaster Miura Everest 2013 is equipped with Japanese manufactory caliber Spring Drive 5R66 30 stones, with a 72 – hour power reserve. Production model is limited to 300 copies. Buy watch Prospex Landmaster Miura Everest 2013 from Seiko is available for $ 5500.